Rob and Wrenn Cavallo partnered to buy The Sports Exchange last fall. 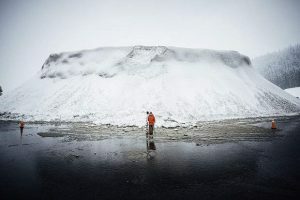 âWe are passionate about the outdoors," Wrenn said. "We want people to have the best experience possible when they shop here." For years, Rob Cavallo spent most of his winter days being a typical ski bum, living the Tahoe life and cutting fresh turns on powder days at Squaw Valley. But he knew it couldn’t last forever. 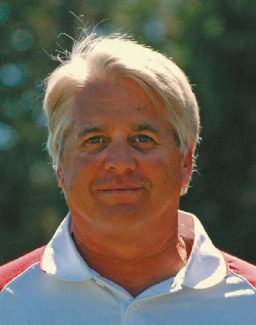 He went to work for The Sports Exchange nine years ago and eventually became its general manager in 2008. Cavallo, a former member of the Squaw Valley ski team, said he loved working for the business and thought of it as his own shop. Before becoming GM, Cavallo met Wrenn Johns on a chairlift while skiing at Squaw in 2007. Johns was a ski instructor during the day and worked at Fireside Pizza at night, and the couple eventually married in 2012. So the couple set their sights on buying the business. They partnered with an investor, Brian Murphy, and purchased The Sports Exchange from Brent and George Cutler on Nov. 1, 2013. “It was the worst winter ever, but we made it through,” Wrenn said with a smile. For the past few years, Wrenn worked for Switchback PR + Marketing before working full-time at The Sports Exchange in May as its public relations and marketing director. She also manages its social media and keeps the books. In a market saturated with sporting goods stores and others potentially opening in the future, the husband and wife team know they need to rethink their business. Another challenge the couple is looking to overcome is the growth in popularity of online shopping, which often cuts down on the number of people who walk into a business. “The market is challenging, and there is a lot of competition here,” Rob said. Despite those challenges, The Sports Exchange builds its business on grassroots referrals and people’s passion for the outdoors. “We understand that buying a pair of skis or a stand-up paddleboard is a big investment, and we want our customers to be happy with their purchase,” Wrenn said. While the winter remains their bread and butter, the couple agrees that The Sporting Exchange would not be successful without the summer season. The Sports Exchange recently partnered with Cyclepaths and Tahoe Mountain Guides to offer an overall sports experience from the shop. Greg Forsyth, owner of Cyclepaths, has been in the bike business since 1985. His company is a full service bike shop. Ken Long of Tahoe Mountain Guides offers snowshoe, mountain bike and paddle tours. Both companies share space and work out of The Sports Exchange. “We like the idea of creating a sporting goods co-op concept so you can get everything you need under one roof,” Wrenn added. 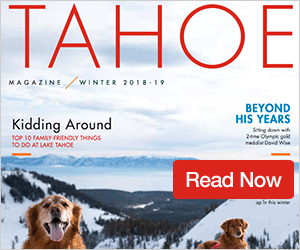 They also partner with the Sierra Avalanche Center, Truckee Donner Land Trust and The Humane Society of Truckee-Tahoe, among other groups and organizations. For example, the Cavallos recently hosted a benefit to help the Land Trust raise funds toward its planned purchase of 10 acres of land west of Donner Lake near Donner Summit, which include the popular 350-foot granite climbing wall known as Black Wall. The Sports Exchange also set up a booth on Truckee Thursdays this year for wider visibility, and staff is on hand at the west end of Donner Lake on Saturdays with free paddleboard demos. The Sports Exchange was voted the No. 1 Sporting Goods Shop and No. 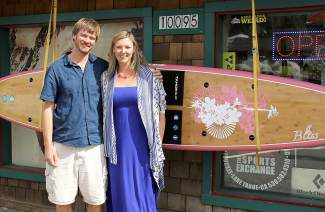 2 Best Ski and Board Shop in the 2014 Best Of North Lake Tahoe & Truckee contest. The couple said they owe this to their customers, and because of their dedication, they want to continue to offer quality service. Further, the shop has changed a lot recently. The duo pulled down its deteriorating and outdated climbing wall, and they also expanded the back of the store and added a small office. While more changes are planned, Wrenn admitted that she’d like things to move a bit faster.